Akoma Arts formed in 2011 is a 501c3 Non-Profit organization under the fiscal sponsorship of The San Jose Multicultural Artist Guild (SJMAG), provides a wide array of Musical and Artist services in the South Bay related to African Drumming and community service is at the core of our mission and vision. Akoma Arts sponsors two African (Afro-Fitness) Dance Classes per week, Thursday evenings at the Alma Community Center and Saturday mornings at the Hoover Community Center. We have also been very active in the schools, supporting cultural school assemblies, events and fairs of all kinds and for all grade levels with African drumming, dance and storytelling, African American Folksongs, Spirituals as well as Storytelling.Lastly and most important in our hearts, we have been working with several doctors at El Camino Hospital to provide Drum therapy for stroke and other patients regaining coordination and full usage of the limbs and brain function. Our services there include, teaching drumming, dance, sing-a-longs, and storytelling. We have also provided drumming and drum making services at the Morgan Autism Institute for both the children and adult classes. Akoma Arts currently has Artist in Residence contracts with College Track of East Palo Alto and Montgomery Elementary School (San Jose) and provides weekly drum instruction at both locations. West African (Interactive) Drumming and Dance Performance We perform over 35 culturally based school assemblies and cultural events per year, with the intent of connecting and bringing together communities by introducing Drum, Dance and Songs of the African Diaspora. Our primary audience being our local K-12th Grade student community and we also provide Professional Development to Teachers and educators interested in learning or upgrading their skills or as a team building event. With drumming and dance as the centerpiece, we involve our audiences with hands-on and feet-on opportunities to experience how their own heartbeat is a drumbeat and the basis for all rhythm. We can provide up to 20 drums and 2-3 trained dancers, which can be scaled down to meet fit the event. We teach hand drumming technique and dance movements as well vocalizing in native African dialect and through our residency program we can culminate with a student showcase. 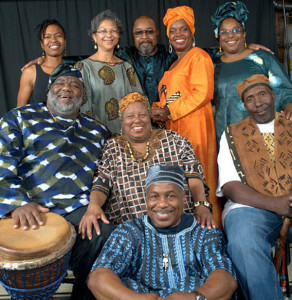 Our performance program also serves as cultural edutainment, with performances of both West African Songs (in dialect) and African American Spirituals and Folksongs performed in five segments, which takes the audience on a journey from the African Village, the Middle Passage, Enslavement era, Emancipation era, and finally to the re-connection to Africa. We also provide classes once a week to those students and adults interested in continuing their drum and dance practice through our H.E.A.R. programs (Healthy Energizing Attitude and Rhythm) and Adult Drumming and Afro-Fitness Classes. We are available year round and need to schedule performances or workshops 30 days in advance. Residencies also need 30-45 days advance notice. Classrooms to Gymnasium indoors or playground space for outdoor performances. Minimum of one (2-3 preferred) microphone with sound reinforcement. Monitor speaker, if available. Santa Clara, San Mateo, Santa Cruz Counties. Any cancellations are requested to be made seven (7) days prior to the event date.